Knossos, approximately 5 kilometers (3 miles) from Iraklion, the modern capital of Crete, was one of the most ancient and most unique cities of the Aegean and of Europe. Knossos was first inhabited shortly after 6000 B.C.E. , and within 3,000 years it had became the largest Neolithic-age (c. 5700–2800 B.C.E. ) settlement in the Aegean. During the Bronze Age (c. 2800–1100 B.C.E. ), the Minoan civilization developed and reached its culmination as the first Greek cultural miracle of the Aegean world. The water supply and drainage systems of Knossos were most interesting. An aqueduct supplied water through tubular conduits from the Kounavoi and Archanes regions and branched out into the city and the palace. Pressure conduits were used within the palace for water distribution. The drainage systems consisted of two separate systems, one to collect the sewage and the other to collect rainwater. Unfortunately, around 1450 B.C.E. , the Mycenaean palace was destroyed by an earthquake and fire, as were all the palatial cities of Crete. Anatolia, also called Asia Minor, which is part of the Republic of Turkey, has been the crossroads of many civilizations during the past 10,000 years. During the past 4,000 years, going back to the Hittite period (2000–200 B.C.E. ), there are many remains of ancient urban water-supply systems, including pipes, canals, tunnels, inverted siphons, aqueducts, reservoirs, cisterns, and dams. An example of one city is Ephesus, which was founded during the tenth century B.C.E. as an Ionian city out of the Artemis Temple. In the sixth century B.C.E. , it settled in the neighborhood of the Artemis Temple. Water was supplied to Ephesus from springs at different locations. In addition, water-well cisterns supplied water to the city. Water for the great fountain, built during 4–14 A.D., was diverted by a small dam at Marnss and conveyed to the city by a 6-kilometer-long (3.7-mile-long) system consisting of one larger and two small clay pipelines. The latrine, which is a public toilet, was built in the first century C . E . at Ephesus. The toilets were placed side by side with no partition. In the middle was a square pond, and the floors of the latrine were paved with mosaics. Baths were also unique in ancient cities, such as the second-century C . E . baths in Ephesus, which had a salon and central heating. The first such building had three floors as well as a hot bath ( caldarium ), a warm bath ( tepidarium ), a cold bath ( frigidasium ), and a dressing room ( apodyterium ). In the fourth century, a woman named Skolacticia modified the bath to make it amiable to hundreds of people. There were public rooms and private rooms, and people could stay there for many days if they wished. Hot water was provided by a furnace and a large boiler. Perge, located in Anatolia, is another ancient city that had a unique urban water infrastructure with a majestic fountain ( nymphaion ) that consisted of a wide basin and a richly decorated architectural facade. Because of the architecture and statues of this fountain, it was one of Perge's most magnificent edifices. A water channel ran along the middle, dividing each street and bringing life and coolness to the city. As in other ancient cities in Anatolia, three separate baths existed ( caldarium, tepidarium, and frigidarium ). The early Romans devoted much of their time to useful public works projects. They built roads, harbor works, aqueducts, temples, forums, town halls, arenas, baths, and sewers. The prosperous early Roman citizen typically had a dozen-room house, with a square hole in the roof to let rain in and a cistern beneath the roof to store the water. Many aqueducts were built by the Romans, who, however, were not the first to build these. King Sennacherio built aqueducts, as did both the Phoenicians and the Helenes. The Romans and the Helenes needed extensive aqueduct systems for their fountains, baths, and gardens. They also realized that water transported from springs was better for their health than river water and did not require lifting the water to street level as did river water. Roman aqueducts were built on elevated structures to provide the needed slope for water flow. Knowledge of pipe making—using bronze, lead, wood, tile, and concrete—was in its infancy, and the difficulty of making large high-quality pipes was a hindrance. Most Roman piping was made of lead, and even the Romans recognized that water transported by lead pipes posed a health hazard. The water source for a typical water-supply system of a Roman city was a spring or a dug well, usually with a bucket elevator to raise the water. If the well water was clear and of sufficient quantity, it was conveyed to the city by aqueduct. In addition, water from several sources was collected in a reservoir and then conveyed by aqueduct or pressure conduit to a distributing reservoir ( castellum ). Three pipes conveyed the water—one to pools and fountains, the second to the public baths for public revenue, and the third to private houses for revenue to maintain the aqueducts. Remnants of ancient and modern-day aqueducts can be found worldwide. 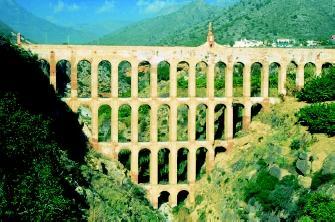 Shown here is the Eagle Aqueduct (El Acueducto del Aguila), which was built in the nineteenth century to move water from the town of Nerja, Spain to nearby Maro, where the local sugar mill was located. Older aqueduct systems often involved vast networks of interlinking segments. Irrigation was not a major concern because of the terrain and the intermittent rivers. Romans did, however, drain marshes to obtain more farmland because they were concerned about the bad air, or "harmful spirits," rising from the marshes, which they thought caused disease. The diseasecarrying mechanism was not the air but the malaria-carrying mosquito. Empedocles, the leading statesman of Acragas in Sicily during the Persian War (sixth century B.C.E. ), drained the local marshes of Selinus to improve the people's health. He also theorized that all matter is made of four elements: earth, air, fire, and water. The fall of the Roman Empire extended over a 1,000-year transition period called the Dark Ages. During this period, the concepts of science related to water resources probably retrogressed. After the fall of the Roman Empire, water and sanitation—indeed, public health—declined in Europe. Historical accounts tell of incredibly unsanitary conditions—polluted water, human and animal wastes in the streets, and water thrown out of windows onto passersby. Various epidemics ravaged Europe. During the same period, Islamic cultures on the periphery of Europe had religiously mandated high levels of personal hygiene. SEE ALSO Drinking Water and Society ;> Infrastructure, Water-Supply ; Human Health and Water ; Irrigation Systems, Ancient ; Leonardo da Vinci ; Utility Management ; Wastewater Treatment and Management. Crouch, D. P. Water Management in Ancient Greek Cities. New York: Oxford University Press, 1993. De Camp, L. S. The Ancient Engineers. New York: Dorset, 1963. Evans, H. B. Water Distribution in Ancient Rome. Ann Arbor: University of Michigan Press, 1994. Garbrecht, G. "Sadd-el-Kafara: The World's Oldest Large Dam." International Water and Power Dam Construction, July 1985. Robbins, F. W. The Story of Water Supply. London, U.K.: Oxford University Press, 1946. Rouse, H., and S. Ince. History of Hydraulics. New York: Dover, 1963. Van Deman, E. B. The Building of Roman Aqueducts. Washington, D.C.: Carnegie Institute of Washington, 1934.
that irrigation system is like so cool. Even i wouldnt even think about the irrigation system. Um... What about the Celts?? What water sources did they use?? ?